Steven Hassan is the guest on this week's special fundraising month episode of The Chauncey DeVega Show. He is one of the world's foremost experts on cults and mind control. Steven Hassan is the author of several bestselling books including Combating Cult Mind Control: The #1 Best Selling Guide to Protection, Rescue, and Recovery from Destructive Cults, Releasing the Bonds: Empowering People to Think for Themselves, and Freedom of Mind: Helping Loved Ones Leave Controlling People, Cults & Beliefs. He and Chauncey discuss how Donald Trump is a political cult leader and if it is possible to free Trump's followers from his thrall. Steven also shares his thoughts on the power of social media and advertising over free will. He also offers up some information that may be new to many people: as a child Donald Trump was raised in a church whose leaders used mind control techniques against their followers. In this week's episode, Chauncey highlights how Trump's White House is corrupt and likely a criminal enterprise. The most recent example? Jared Kushner receiving hundreds of millions of dollars in loans from Citibank and Apollo Global Group. Chauncey also connects the dots between Trump's abuse of power as a means to make money from the presidency, the latest revelations about Kushner and the conflict between Saudi Arabia and Qatar, and General Smedley Butler's warnings about war profiteers and other gangster capitalists. At the end of this week's podcast Chauncey also wonders if the ammosexuals who go to church to get their AR-15 assault rifles "blessed" are somehow related to the underground mutants who worship a neutron bomb in the movie Beneath the Planet of the Apes. Ep. 192: What was It Like to be Jewish and to Live Across the Street From Hitler? Ep. 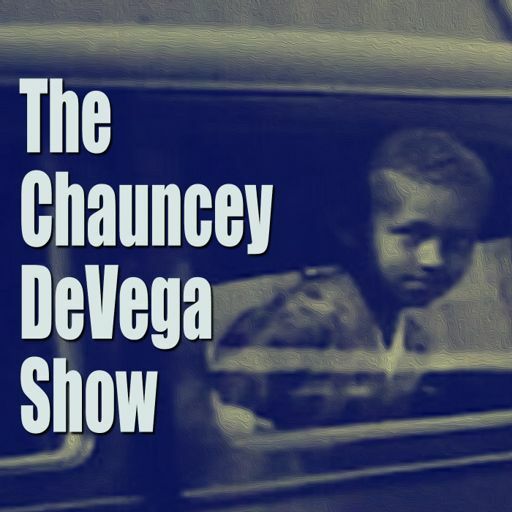 190: Black Genius and Childish Gambino's "This is America"
There are two guests on this week's special fundraising month episode of The Chauncey DeVega Show. There are two guests on this week's special fundraising month all things Black Panther episode of The Chauncey DeVega Show. Ep. 169: White Supremacy and the So-Called "War on Christmas"
Frank Miller is the guest on this week's episode of The Chauncey DeVega Show. Ep. 117: Ben Winters talks "Underground Airlines"
Ep. 108: Daniel Czitrom on the Gilded Age, Corruption, and "Copper"
This week's episode of The Chauncey DeVega Show features writer Jared Yates Sexton. This is the second installment of a two-part conversation. This week's episode of The Chauncey DeVega Show features writer Jared Yates Sexton. This week's episode of The Chauncey DeVega Show features Claire Conner. She is the author of Wrapped in the Flag: A Personal History of America's Radical Right. This week's episode of The Chauncey DeVega Show features two great guests and friends of the podcast. This special installment of The Chauncey DeVega Show features four different guests in three acts. In this special installment of The Chauncey DeVega Show, Chauncey shares his experience at the Chicago Donald Trump "No-Show" Rally. Historian Heather Cox Richardson is the guest on this week's episode of The Chauncey DeVega Show. Ep. 59: John Michael Williams Talks Suicide, Life, Hope and "Bridgend"
Nina Hartley is the guest on this week's edition of The Chauncey DeVega Show. Ep. 25: Nick Chiles Ponders "Justice While Black"